Operate uses Prefixes to distinguish your Invoices and Credit Notes according to Organizations, Locations or Client Types. Prefixes are used separately, for Invoices and Credit Notes, but the starting configuration is done in the same area for both - Settings > General > Customize > Invoices > Invoice/Credit Note Numbers. Credit Note numbers are used in ascending order, for both Invoices and Credit Notes, across all Locations and Client Types, srarting from the the number you set as a starting number for the Prefix. This prefix will be used for all locations that do not have a prefix of their own. If Client Type have no set prefix either, they will also use the general one. Please Note: Operate starts numbering credit notes from the number following the one you set. if you have already reached credit note number 100 in your business, for example, you can add 100 as a number and Operate will be numbering your credit notes starting with 101. If you are starting with your first credit note, enter 0 as a number and Operate will start from 1. If you need to set up a Credit Note number to start from, you will also need to configure a prefix. If you haven't been using prefixes so far, please decide upon a combination of letters and/ or digits that you would like added to your credit notes and use it here. You can also set your prefix to "0" if you want your numbering to be similar to what you've been using. Get started by going to Settings > General > Customize > Invoices. Add your invoice Prefix and Number. The number should be the one at which you wat to start the automatic numbering of your invoices. You can now use this Prefix for your Credit Notes for specific Locations or Client Types. Please note that the same prefixes, set up as shown above, can be used for both Invoices and Credit Notes, therefore you may want to decide on prefixes that are specific to each type of document. Once you have your Credit Note Prefix set up, go to Space > Locations and click the pencil icon next to the Location you want to set the Prefix for. This will open your Location page in editing mode. Scroll down to the Site Financial Details section and look for the Credit Note Prefix dropdown. Select yours, then save your changes to ensure the Prefix is applied. If you do not see the |Credit Note Prefix field, please add it by editing the Location Page Layout. To do so, go to Settings > General > Customize > Locations > Page Layouts. Then search for the Invoice Prefix field and drag it onto the page, in any area you prefer. Read more about customizing page layouts in Operate. Please note that the Location Prefix takes priority over the general one, configured in the Settings. Therefore, if you need to change the prefix for any particular building, please do so within the Location page. When changing prefixes, invoice numbering will continue with the next number, across all locations. 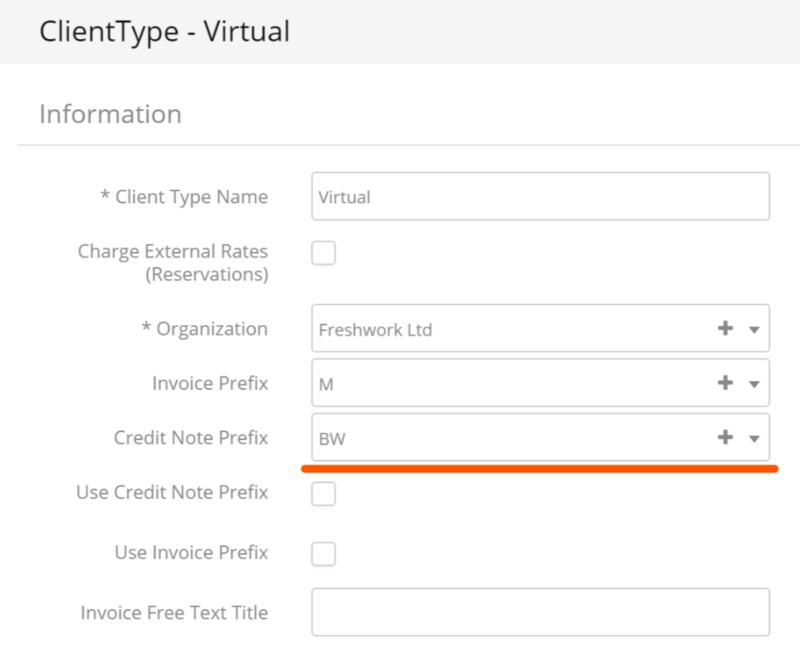 You can also set a Client Type specific Prefix, which will apply to Credit Notes generated for customers that are set to the Client Type you configure the Prefix for. To get started, go to Settings > General > Organizations > Client Types and click the pencil icon next to the Client Type you want to edit. Find the Credit Note Prefix dropdown, select the one you need, then save your changes to enable it. Please note: The Client Type Prefix takes priority over the general and Location specific Prefixes. If a certain client type does not have a Prefix, then it will receive the one assigned to the Location. If there is no Prefix on the location either, then it will receive the general one.